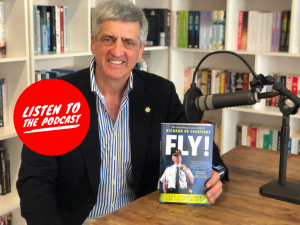 This week Cheryl is joined by pilot and best-selling author Richard de Crespigny to discuss his latest release Fly! – Life Lessons from the Cockpit of QF32. Together they discuss the ways in which humans react to fear (in the context of flying, both as a passenger and a pilot), and how much of this fear is irrational and can be overcome by changing the way we think and understanding more about the ways in which aircrafts operate. In 1975, aged seventeen, he joined the RAAF. One year later, he started flying. During his 11 years flying transport, jet and helicopter aircraft with the RAAF, he was seconded as Aide-de-Camp to two Australian Governors-General – Sir Zelman Cowen and Sir Ninian Stephen. Richard remained with the RAAF until 1986 when he joined Qantas, flying Boeing 747, Airbus A330 and A380 jet aircraft.